A-Frame Table tents for restaurants are turned edge construction using imitation leather book cloth with matching diagonal corner tabs to hold inserts firmly in place. 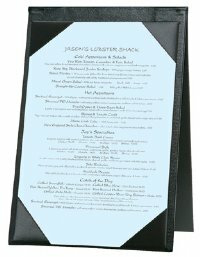 These sturdy restaurant table tents hold 2 inserts sheets, one on each side. Ready to Ship A-Frame table stands are available in black only. Table Tents normally ship in 24 – 48 hours. Promote Wines, Drinks or your restaurant Specials on your dining room tables, bar, counter tops and all your other high visibility areas with one of our Restaurant Table Tent Menu Holders.